A share swap arrangement signifies issuance of a share in exchange for a share rather than remittance of cash consideration. Share Swap arrangements occur when shareholders’ ownership of the target company’s shares is exchanged for shares of the acquiring company as part of any restructuring. For instance, two companies, A and B, come together to form company C. If the two companies enter into a Share Swap Arrangement, the shareholders of company A can be given shares of company C for every share of company A that they owned. A similar arrangement can be made for company B as well. Now, if such an arrangement occurs between companies wherein the Indian parties are shareholders of the Indian company and the other company is a foreign company, the arrangement would attract both regulations prescribed under the Foreign Exchange Management (Transfer or Issue of Any Foreign Security) Regulations, 2004 (the ODI Regulations) and the Foreign Exchange Management (Transfer or Issue of Security by a Person Resident outside India) Regulations, 2017 (the FDI Regulations). Share Swap arrangements can be useful mechanisms to raise investment in the case of an externalisation plan. Externalisation plans involve promoters of Indian entities moving their holding entities outside India (in case more information about externalisation is required, refer to our article on externalisation schemes, which can be accessed at https://novojuris.com/2018/06/24/ externalisation-many-Indian-startups-are-choosing-to-have-their-holding-entity-outside-india/). In such scenarios, both FDI Regulation and ODI Regulations become applicable owing to the fact that there is a transfer of shares of an Indian company to a person resident outside India and there is an acquisition of shares of a Foreign Company by a resident Indian in the manner. Therefore, an adherence with the applicable FDI Regulation and ODI Regulation is required for the share swap arrangements. The FDI Regulations would be applicable in the case of a share swap arrangement where any one company to the transaction is non-resident and the transaction becomes eligible to be governed by the Foreign Exchange Management (Transfer or Issue of Security by a Person Resident Outside India) Regulations, 2017 and Foreign Direct Investment policy (“FDI Policy”) issued by the Department of Industry Policy and Promotion every year. A key thing that has to be kept in mind is that as per the FDI Regulation, the price of shares offered should not be less than the fair market value of shares valued by SEBI registered Merchant Banker. second being through the filing of an FC-GPR (Foreign Collaboration- General Permission Route) Form by the Indian company which becomes applic`able in the case of allotment of-of shares by an Indian Company to a person resident outside India. General permission has been granted to non- residents to acquire shares from Indian shareholders under swap arrangement, provided that the price of shares offered is not less than the fair market value of shares valued by SEBI registered Merchant Banker. However, in the case of share swap arrangement between the entities whose sector is under Government approval route, prior approval would be required. As mentioned above, the ODI Regulations would be applicable in the case of a share swap arrangement where any one company to the transaction is non-resident. In case of share swap arrangement under externalization, the shareholders of Indian company who are resident Indians would acquire shares of the foreign company in exchange for their shares of the Indian company. The share swap arrangement under the ODI Regulations would fall under the automatic route unless otherwise prescribed under FDI Regulation. The arrangement would also be subject to the sectoral caps and entry mechanisms as applicable under the FDI Regulation and approvals from the relevant ministries. The resident Indian shareholders of an Indian company would be required to file Form ODI with the Authorised Dealer Bank for reporting the share swap arrangement. The Form is required to be submitted to the RBI within 30 (thirty) days of making the share swap. From a regulatory standpoint, the key question which is not clear is whether the share swap arrangement would fall under general permission category of ODI Regulation & FDI Regulation or under the Government approval. While the respective regulations are clear that prior approval is needed only in case if the sector is under approval route as per FDI Policy and FDI Regulation. However, practically it has been seen that the Reserve Bank of India on case to case basis, has insisted upon such prior approval requirement. There is a need for better clarification or notification from the Reserve Bank of India. Additionally, it is pertinent to note that the ODI Regulation mandates for prior approval of the Foreign Investment Promotion Board (FIPB) which has been abolished in 2017. Now, in case any such approvals are required, the proposals will be scrutinized and cleared by sector-specific departments concerned. This entry was posted in Articles and tagged FC-GPR, FDI regulations, M&A, Mergers and Acquisitions, NovoJuris Legal, ODI regulations, SEBI, Share Swap on August 30, 2018 by novojuris. The Ministry of Civil Aviation on 27 August 2018 by way of a Press Note released the Drone Regulations 1.0 in the furtherance of enabling safe, commercial usage of drones effective from 1 December 2018. The Press Note provides for the setting up of a Drone Task Force under the Chairmanship of the Minister of State to provide draft recommendations for Drone Regulations 2.0. The Office of the Director of Civil Aviation furthermore released a detailed document containing requirements for the operation of RPAS on 29 August 2018. The Regulations provide for an online platform for registering and operation of drones by the name of the Digital Sky Platform. This platform is designed to be an unmanned traffic management (UTM) platform which can be operated through a mobile application and users will be required to seek permission on this application. The request for use of drone would be processed by an automated algorithm and the request would be subjected to acceptance or refusal almost immediately. These Regulations implement the policy of no usage without registration. Every drone user would be required to register their drones and a Unique Identification Number (UIN) would be generated against such registration. This registration would be in regard to the drone and not the user. The user would be required to seek permission to use the drones before every instance of usage. Micro : Greater than 250 gm and less than or equal to 2 kg. Mini : Greater than 2 kg and less than or equal to 25 kg. Small : Greater than 25 kg and less than or equal to 150 kg. The requirement for seeking permission for use of RPAS systems does not apply for drones falling under the nano category. The UTM would operate as a traffic regulator in the drone airspace and would co-ordinate closely with defence and civilian air traffic controllers to prevent unauthorised flights and to ensure that drones remain on approved flight paths. Additionally, an Unmanned Aircraft Operator Permit would be required by RPA operators. 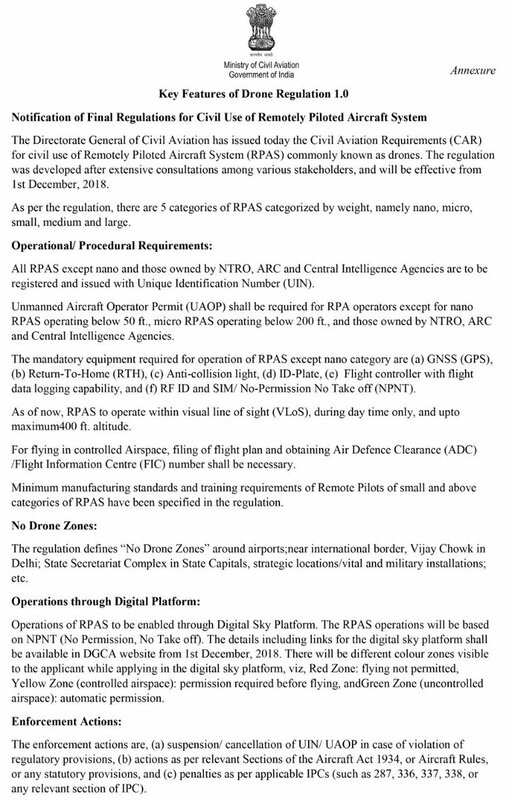 The requirement to obtain this permit does not apply in the case of nano RPAS operating below 50 feet, micro RPAS operating below 200 feet and for RPAS owned by the NTRO, ARC or Central Intelligence Agencies. However, micro RPAS operators would be required to provide an intimation to their local police station at least 24 hours prior to usage. In regard to usage by agencies, they would be required to provide an intimation to local police stations and ATS units prior to usage. Yellow Zone: this is a controlled zone and operation of drones would be subject to prior approval. For operation of drones in this zone, filing of flight plans and obtaining Air Defence Clearance/ Flight Information Centre number would be necessary. Green Zone: this would form the uncontrolled airspace with an automatic permission for operation of drones. 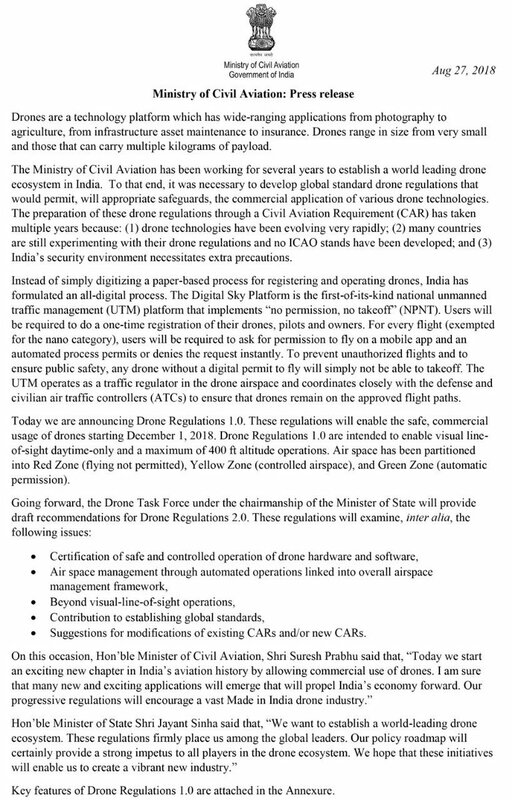 This entry was posted in regulatory updates and tagged drones, Laws for Drones in India, Ministry of Civil Aviation, NovoJuris Legal, Unamed Aircrafts on August 30, 2018 by novojuris. The Ministry of Corporate Affairs(“MCA”) on 31 July 2018 published the Companies (Accounts) Amendment Rules 2018. With the amendment coming into effect, the MCA has mandated few insertions to be made by a Company while preparing its Board Report and the disclosures to be made by a Small company and One Person Company while preparing their Board Report. a statement that the company has complied with provisions relating to the constitution of Internal Complaints Committee under the Sexual Harassment of Women at Workplace (Prevention, Prohibition and Redressal) Act, 2013. The Rule 8 is not applicable on One Person Company or Small Company. This entry was posted in regulatory updates and tagged Companies Amendment Rules, ministry of corporate affairs, NovoJuris Legal on August 20, 2018 by novojuris.